It bothers me that God would do that. A plague of poisonous snakes is a harsh punishment to visit on people who, after all, were just grumbling and complaining like they had done on several occasions during their 40 year journey in the desert. Plus, the thought of all those poisonous snakes makes me shudder. Listen to Lawrence of Arabia describing his experience of snakes in the desert: “The valley seemed creeping with horned vipers and puff adders, cobras and black snakes. By night movement was dangerous; and at last we found it necessary to walk with sticks, beating the bushes on each side . . . I think that would be enough to send shivers down my spine. And so, Moses fashions a snake of bronze and hangs it on a pole. And the snake-bitten people look up at it and live. What a bizarre cure—to look at the very thing that is tormenting you. Or maybe it isn’t so strange, really. You may know that the symbol of the American Medical Association is a staff with two serpents intertwined upon it. I’m not sure how that’s supposed to be related to healing. So, I googled it, and found that some say it has something to do with the healing properties of snake venom. I think that’s one way to look at this serpent on the pole. Think about our common vaccines. We inject babies with a form of the very germs that cause disease, in order to trigger the formation of antibodies that will protect them from things like smallpox, whooping cough, and diphtheria. The same thing happens when we get a flu shot each winter. 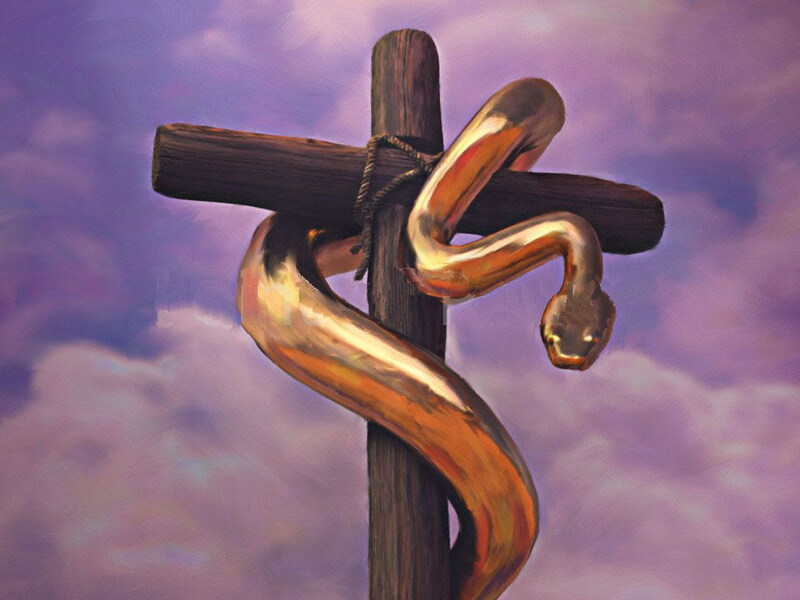 The people were instructed to look at the serpent on the pole as a symbol of healing. And then there’s another way to think about that serpent on the pole. Sometimes in life there are serpents that keep biting us. They won’t go away. Addiction is a serpent that bites again and again, injecting such poison into families that it passes to the next generation. Hatred and bitterness is like a deadly poison that infects our relationships. Worry is a serpent that sleeps next to us at night. Fear is a snake that lies coiled in our hearts, ready to strike; and how about the cobra of indifference, or the rattlesnake of resentment? There comes a point, when, for the sake of healing, we must look at the snake and see it for what it is. We must face whatever is poisoning our life, admit its power over us, and find a way of healing. Otherwise, we’re stuck in the snake pit. Still, as Christians gathered for worship, we might wonder why we’re hearing this obscure snake story from an ancient book in the Old Testament. It’s tempting to dismiss it as one of those over-the-top Old Testament tales about God getting fed up with his stiff-necked people. We’re modern people, and besides, we have Jesus. Why give attention to this snake story? Well, the reason is because Jesus thought the story was important, and he draws our attention to it today. Read with me, these words in our gospel reading: “Just as Moses lifted up the serpent in the wilderness, so must the Son of Man be lifted up, that whoever believes in him may have eternal life.” Jesus harkens back to this story from Israel’s past and connects it to himself. The serpent lifted up on that pole is related to Jesus being lifted up. How are we to understand this? Before we go on, we need to be clear about this lifting up business. We lift people up in prayer. We lift up people we admire. The hero of the winning football team is lifted onto the shoulders of his teammates and paraded around. And when we think of Jesus being lifted up, we’re normally thinking of his ascension into heaven and his being seated at the right hand of the Father. But that isn’t what Jesus means when he talks about the Son of Man being lifted up. He doesn’t mean his ascending into heaven. He’s not talking about being lifted up by angels or eagles’ wings. He means the cross. Jesus, the Son of Man, must be nailed to a crossbar and lifted up by Roman soldiers onto a pole for all to see– just as the serpent in the wilderness was lifted up. When Moses lifted up the serpent, the suffering people gazed on it and lived. Their cure came when their sin, the poison that infected their lives, and repented. When we see Jesus lifted up on the cross, something similar happens. We see what hatred and evil can do, and we see the potential for such hatred and evil that lies within each of us. Jesus tells us that as we look at him on the cross, we must face our sin. We must acknowledge the fast-striking and ruthless serpent coiled within us, and repent. But that is not all the cross reveals, if we are willing to look a little deeper. Jesus lifted on the cross shows us who God is. We see there the Son of God who heals from the cross. His love is our anti-venom. His love is our medicine. Listen again to those first verses of our gospel reading: “Just as Moses lifted up the serpent in the wilderness, so must the Son of Man be lifted up, that whoever believes in him may have eternal life.” Looking to that serpent on the pole gave life to the Israelites. Looking to Jesus on the cross gives us life – eternal, abundant, and full. Eternal or everlasting life, in the Bible, means not only life in the future, on the other side of the grave, but also life here, now, in the present. You and I are still bitten by sin—we know that. But God offers us a holy antidote. God loves the world so much that his Son is given for us. On the cross, God turns curse into blessing, poison into medicine, sin into redemption, and death into life. How often we get consumed, literally devoured at times, by some stressful thing in our lives, because we think that our identity, our future, and our hope depends on it. But our identity is in Christ. Our future is in Christ. Our hope is in Christ. I think this is finally what it means for us to look at Jesus, lifted up on the cross. He has poured out his life for us, and taken the venom of our sin for us, that we might have life, and have it abundantly. To look at Jesus, lifted up on the cross, means to find our identity, our life, our meaning and purpose in him. John 3:16 really says it all: For God so loved the world, for God so loves us, that he gave his only Son, so that everyone who believes in him may not perish” – may not be consumed by the world and its desires – “but may have eternal life” – life that is full and abundant. Life that finds its identity, hope, meaning and purpose in Christ. Thanks be to God. Amen.